What Else Can I Expect From an Online Teaching Degree Program? Undergraduate teaching programs suit anyone with plans to launch a career in teaching, curriculum development, or education administration. Teachers aspiring to work with all grade levels and subjects may choose this degree, as may principals, school administrators, instructional designers, paraeducators, and special education teachers. Education represents one of the most popular undergraduate majors in the United States. According to the National Center for Education Statistics (NCES), roughly 91,623 students received their bachelor's degrees in education during the 2014-2015 academic year. Many modern students are choosing to earn their bachelor's in education online, rather than on a college campus. The best online bachelor's in education programs follow the same rigorous curricula as their brick-and-mortar counterparts, often including student-teaching courses that allow students to hone their skills in real-life classrooms. The asynchronous (or self-paced) structure of many online education programs caters to students with part-time jobs, childcare responsibilities, and other commitments that may interfere with classroom-based coursework. Learn more in this guide about what you can do with an online bachelor's degree in education, and what kind of career opportunities you can expect. CAN YOU GET A TEACHING DEGREE ONLINE? Students can earn teaching degrees online at the bachelor's, master's, and doctoral levels. Students have the option to earn these degrees completely online or in a hybrid format. Read more here. To earn a bachelor's in teaching, students must usually meet minimum GPA and standardized test requirements. Admission requirements vary by school, so students should check with their prospective institutions for more accurate information. Read more here. CAN I GET A TEACHING JOB WITH AN ONLINE DEGREE? To work in public schools, graduates must first acquire teaching certification through their prospective state. Certification usually requires prior work experience, which students may acquire through their bachelor's program. Read more here. CAN I BECOME AN ELEMENTARY SCHOOL TEACHING ONLINE? After earning a bachelor's in teaching and obtaining state licensure, students may apply for elementary school positions. Read more here. CAN YOU GET CERTIFIED TO TEACH ONLINE? Alternative certification programs, such as iTeach and ABCTE, are available online. However, because state requirements vary, students should make sure these programs qualify for the territory they wish to teach. Read more here. WILL AN ONLINE TEACHING DEGREE PROVIDE ME WITH THE SKILLS I NEED TO ADVANCE MY CAREER? An online bachelor's in education covers the fundamental theories and methods guiding modern classroom learning. Students take courses exploring topics like lesson planning, classroom leadership, conflict mediation, and behavioral science. Many bachelor's in education programs allow students to earn specialized degrees; some focus on a specific grade or age level, while others follow specialization tracks in core school subjects like English, history, math, science, art, or music. Other concentrations options may include curriculum and instruction, educational administration, and special education. The best online bachelor's in education programs also prepare students for post-degree requirements, such as licensure. WILL AN ONLINE TEACHING PROGRAM WORK WITH MY SCHEDULE? An online bachelor's in education makes for a flexible alternative to brick-and-mortar programs. Students can access course lectures and readings, submit written assignments, take exams, and communicate with their professors from their home computers, on their own schedules. Current technology also enables them to study on the go using a laptop, tablet, or smartphone. For added convenience, online education majors can arrange student-teaching opportunities at schools and administrative offices near their places of residence. WHAT JOBS CAN I GET WITH MY BACHELOR'S IN EDUCATION? Education professionals often go on to pursue graduate degrees, but a bachelor's degree suffices for many job candidates. The U.S. Bureau of Labor Statistics (BLS) notes a bachelor's degree as the educational minimum for entry-level teachers in kindergarten, elementary, middle school, and high school grades, plus for preschool and special education teachers. Licensing requirements for teachers may vary from state to state, but they often include an exam, a background check, and a minimum number of student-teaching hours. WHAT ARE THE BEST ONLINE BACHELOR'S IN EDUCATION PROGRAMS? Only you can properly evaluate whether a target school's strengths match your educational needs. 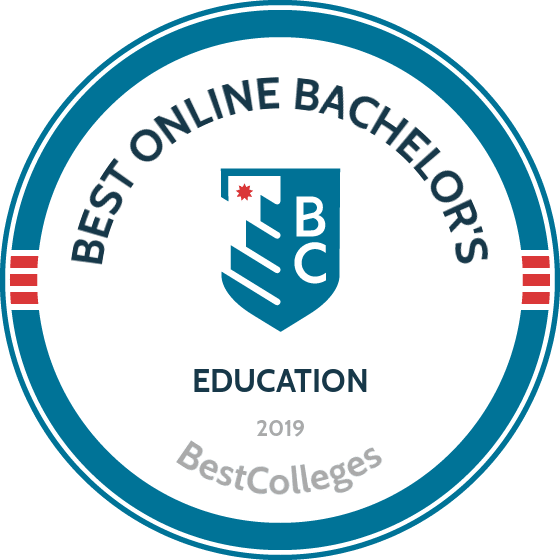 The following ranking of schools should serve as a helpful starting point in your search for the best online bachelor's degree in education programs. Make sure to contact admissions specialists at your prospective colleges and universities to learn more about their specific bachelor's degree requirements and offerings. Located in Philadelphia, this renowned Ivy League college ranks among the country’s top schools. Penn was the world’s first institution to offer a master of applied positive psychology, which uses scientific inquiry to explore the main qualities of successful organizations and individuals. Ideal for working professionals and those interested in advanced academic study, this rigorous one-year program attracts students from around the world. Penn's psychology program uses a hybrid format, combining online instruction with 10 monthly on-campus sessions. These campus immersion experiences provide opportunities for hands-on learning, group activities, one-on-one meetings with faculty, networking, and socializing. While most on-campus sessions last one weekend each, new Penn students must attend a weeklong introductory immersion session at the program's start in September. Candidates pursuing an online masters in psychology complete eight courses and a capstone project. Students complete core coursework during the fall semester, gaining a broad understanding of positive psychology through courses in research methods and foundations of positive interventions. The spring semester explores application strategies for positive psychology techniques, with courses such as humanities and human flourishing, positive education, and applying positive interventions in institutions. The program concludes with a summer capstone course, during which students synthesize and apply their knowledge to a positive psychology project conducted in a career-relevant setting. Candidates work independently throughout the summer, receiving ongoing faculty guidance. Prospective students should hold a bachelor’s degree from an accredited institution, demonstrate an undergraduate GPA of 3.0 or better, and provide exceptional quantitative GRE scores. One of the best-known Ivy League institutions, Harvard boasts world-renowned faculty and top-notch educational resources, including a variety of cutting-edge programs available through the university’s Extension School. Harvard's master's in psychology online presents advanced concepts in human behavior, behavioral science research, scientific outcomes, and investigation design. The unique hybrid curriculum format lets students complete three introductory courses before officially applying to the program: introduction to graduate study and scholarly writing in the social sciences; statistical methods; and one graduate-level psychology course. Candidates who complete these courses with a minimum 3.0 GPA may then submit their official application. Admitted students fulfill the remaining 12 course requirements through a mixture of online classes and three on-campus sessions. Candidates complete four psychology courses, one psychology seminar, one general elective credit, and three thesis or capstone courses. Learners who choose the thesis option work with a faculty adviser to develop an in-depth psychology research project. Taking a practice-oriented approach, the capstone track requires students to apply psychology principles to a real-world problem. Capstone candidates also compose an extensive written paper detailing their project’s scientific background. Prospective students must hold a bachelor’s degree from a regionally accredited institution, and may not have previously earned a degree in a similar field. Applicants should provide their official transcripts and a current resume along with their online application. The program offers fall, spring, and winter start dates, making it easy for students to apply at any time. A prestigious private college based in Los Angeles, USC serves more than 45,000 students. The university’s robust distance education division offers a variety of graduate certificates and degrees, allowing students around the world to pursue one of California's top psychology master's programs online. Integrating research, theory, and practice, USC's master of science in applied psychology explores psychology principles in business practices. The program offers concentrations in organizational psychology and consumer psychology. The organizational track focuses on workforce management strategies, while the consumer track emphasizes marketing services management. Most candidates take two courses each term and complete their studies in about 16 months. The 34-credit curriculum consists of core courses, concentration electives, and a practicum. The 20-credit core addresses foundations and applications of human behavior, research methods, and major organizational and consumer psychology principles. Candidates build specialized knowledge and skills during 12 credit hours of advanced concentration coursework. For example, students on the organizational psychology track complete courses in strategic business relationships, psychology of organizational change, and group dynamics and leadership. Students may also enroll in courses from either concentration to better fit their professional goals and interests. While distance learners complete all coursework online, the program includes a two-credit practicum/internship experience in an approved professional environment. USC typically allows students to perform the field experience at an organization in their own community. The program offers three annual start dates in the fall, spring, and summer. Founded in 1785, UGA is one of the nation’s oldest public colleges. Today, the school serves more than 38,000 students through its Athens campus and sizeable distance education program. UGA’s unique web-based degree offerings include graduate programs in avian health, media writing, and a master's in psychology online. The two-year master of education in educational psychology, applied cognition and development examines cognitive, developmental, and motivational practices within educational and psychology practice contexts. The program offers four secondary concentration areas: learning across the lifespan, learning with technology, qualitative approaches to education, and development of high intellectual capability. Students complete the 34-credit curriculum in 10-person cohorts, adhering to a set course sequence. In addition to 25 core credits, candidates take nine credit hours within their chosen concentration. The program core introduces major psychology and education concepts, including foundations of educational cognition, nurturing independent learners, and research methods in education. Each candidate then selects three courses in their focus area. For example, students specializing in learning across the lifespan take classes such as a survey of educational gerontology, adult learning and instruction, multicultural issues in adult education, and student learning in workforce education. The program concludes with an applied project in educational psychology, during which students address a topic or problem in their focus area. Georgia residents and out-of-state students pay the same tuition rates for online programs. Prospective UGA students must hold a bachelor’s degree from an accredited institution and an undergraduate GPA of 2.7 or better. Applicants should also provide GRE or MAT scores, three letters of recommendation, and a personal statement. Based in New York and founded on Jewish values, the Touro College and University System is comprised of 30 schools around the world and the TUW distance education platform. Emphasizing applied skills and flexibility, TUW’s online degrees were developed to accommodate working students. TUW’s online master of arts in psychology focuses on the practical application of psychology principles in professional contexts. Students pursuing an online master's in psychology can choose from three concentration options: media psychology, educational psychology, and health psychology. Most courses follow an asynchronous format with no required meeting times, allowing distance learners to complete assignments when convenient. Full-time students can earn their degree in just 12 months. The 36-credit curriculum consists of 27 core credits and nine credit hours within the student’s concentration. Core courses explore fundamental general psychology concepts, including developmental issues across the lifespan, professional ethics, group dynamics, and applied research methods and statistics. During three concentration courses, candidates build specialized knowledge in their focus area. The health psychology concentration, for example, explores changing health behaviors, psychology and aging, and stress and coping. All learners complete a final research-based capstone project in their area of professional interest. Prospective students must hold a bachelor’s degree from an accredited college or university and demonstrate an undergraduate GPA of 2.5 or higher. Applicants may transfer up to 30% of their required credits from another accredited school. TUW offers an assortment of student support services, including enrollment assistance, academic advising, and career counseling. This private San Francisco college was an early pioneer in distance education, offering its first online courses in 1997 and an entirely web-based degree in 1998. Today, the school hosts one of California's top psychology master's programs online: a master of arts in industrial-organizational psychology. This program is also available in a hybrid format. The program imparts versatile, broadly applicable skills, and graduates find work in many different industries and settings, including healthcare, technology, consulting, entertainment, and government. Over 42 credit hours, candidates explore strategies for increasing employee wellbeing and workplace functionality by applying psychological principles to business organizational practices. The 33-credit core curriculum introduces fundamental topics in industrial-organizational psychology, including organizational group dynamics, managerial excellence, executive coaching theory and practice, and international human resources management. Students complete nine elective credit hours, choosing from a variety of human resources and psychology courses that examine workforce trends, ethics in employee management, and conflict resolution skills and techniques. The program also includes an applied psychology internship, which provides practical training in an approved professional environment. Online learners may complete the internship at a location within their own community. GGU's program provides flexibility for working adults, using an asynchronous format that requires few scheduled class meetings. Online students also benefit from a generous credit transfer policy and significant administrative support, including academic advising and career counseling. Before gaining admission, prospective students must demonstrate math and writing proficiencies through placement testing. GGU may waive placement testing requirements for candidates with sufficient GMAT or GRE scores. Located in Malibu, California, Pepperdine is a private Christian college known for its exceptional psychology programs. Pepperdine’s online master of arts in clinical psychology with an emphasis in marriage and family therapy examines the social, economic, and psychological factors that affect couple and family relationships. The rigorous curriculum provides students with the skills to diagnose clients, devise treatment plans, and facilitate patient therapy processes. Graduates hold the educational background to pursue credentials as licensed marriage and family therapists or licensed professional clinical counselors. The online master's in clinical psychology curriculum includes 62-68 credits. Candidates with an undergraduate background in psychology may be permitted to skip up to six credits of foundational coursework. All candidates complete a total of 22 general psychology and marriage and family therapy courses, exploring topics such as multicultural counseling, individual and family substance abuse treatment, human sexuality and intimacy, and trauma in divorced populations. Emphasizing hands-on training, the curriculum requires all students to complete 700 total clinical hours across four field placements. Licensed marriage and family therapy counselor candidates must complete at least 225 hours of direct patient contact, while licensed professional clinical counselor candidates must fulfill at 280 direct contact hours. Although Pepperdine's counseling curriculum meets California licensure requirements, out-of-state students should consult their state licensing board to ensure that the program meets all eligibility guidelines. For example, the curriculum does not meet licensed marriage and family therapy counselor requirements in Arizona, Connecticut, Illinois, New Hampshire, and Texas. Based in Davie, Florida, NSU maintains regional campuses around the state and a substantial distance program. NSU’s unique graduate-level programs include degrees in oceanography, osteopathic medicine, and an online master of science in general psychology. The online psychology degree features 30 total credit hours, with 21 credits dedicated to core coursework and nine credits in the student’s concentration area. The program core introduces major topics in general psychology, including behavioral neuroscience, social psychology, research design, and psychological quantitative methods. The program builds generalized knowledge in psychological theories and research methods, preparing graduates for professional employment or doctoral study in the field. Emphasizing flexibility for working students, NSU offers a fully online, mostly asynchronous course delivery format with start dates in the fall, winter, summer. Prospective students should note that the online master's in psychology does not meet licensure or certification requirements in the state of Florida. Candidates may pursue a general psychology or applied health science concentration, both of which offer several additional pathways. Students who select the general psychology track may substitute two courses with a six-credit thesis, performing in-depth, original research related to an approved psychology topic. NSU recommends the thesis track for candidates who intend to pursue doctoral studies after graduation. Students who forgo the thesis option complete courses in adult psychopathy, human sexuality, and history and systems of psychology. The applied health sciences track looks at psychological methods within a healthcare industry framework, examining psychological aspects of disease treatment, the business of psychology, and interviewing techniques. This graduate college offers several specialized psychology master's programs online, including degrees in general psychology, forensic psychology, industrial-organizational psychology, and international psychology. While most programs are presented entirely online, many include mandatory field experiences that may necessitate travel. The general psychology path offers an assortment of concentration options, including public health, social and community psychology, and child and adolescent psychology tracks. All candidates complete 36 credits, divided among a 21-credit core curriculum, nine concentration credits, and a six-credit applied research project. The general program core introduces fundamental psychological theories and research methods, while the three concentration courses delve into specialized subfields of psychology. Students pursuing the organizational leadership track, for example, examine topics in gender and leadership, organizational behavior, and emotional intelligence and leadership. In lieu of an internship, candidates complete an extensive applied research project, during which they synthesize and apply course concepts to a workplace psychology issue. Full-time general psychology candidates typically complete the program in one year, while part-time students usually graduate in two years. Other programs maintain different graduation requirements, feature more coursework, and take longer to complete. The industrial-organizational degree generally requires two years of full-time enrollment or up to four years of part-time study. The three-year forensic psychology pathway, which leads to professional counselor licensure, exclusively accepts full-time students. The international psychology pathway requires two years of full-time study and offers three concentration tracks: environmental advocacy, management and leadership, and trauma and group conflict. Based in Tuscaloosa, this public institution has committed itself to making higher education accessible and affordable. The university’s Bama By Distance division offers an array of web-based degrees and certificates, including an online master of arts in educational psychology with a concentration in learning and assessment. Through 10 required courses, the 30-credit curriculum explores key educational assessment practices and their roots in psychological theory. Covering topics in both education and psychology, the curriculum presents statistical methods in education, the social and cultural foundations of behavior, classroom learning evaluation, and lifespan development. During their final semester, students conduct a capstone research project related to educational assessment. Prospective students should note that completing the master's degree in psychology online does not lead to teaching certification or counseling licensure. Distance learners benefit from UA’s diverse academic support services, which include tutoring, technical support, academic advising, and career counseling. The school's Center for Academic Success provides supplementary instruction workshops on study skills and time management to assist returning students as they adjust to academic life. UND is North Dakota’s oldest college, serving more than 14,000 students from its Grand Forks campus, including nearly 7,000 through distance education. The university’s online master of arts in forensic psychology explores psychological theories and skills through the lens of civil and criminal justice, preparing graduates to assist state agencies in forensic capacities such as trial preparation and jury selection. Ideal for working students, the two-year program follows a part-time schedule and does not require applicants to provide GRE scores. Consisting of a 21-credit core curriculum and nine elective credits, the program includes seven required courses in forensic psychology and general research. Candidates explore readings in psychology and major concepts in psychology, law, advanced univariate statistics, and behavioral pathology. Students may fulfill the elective credit requirement through unique course offerings, including classes on insider threat analysis, cognitive psychology, and the foundations of behavioral data analytics. In addition to major and elective coursework, learners complete an independent study course, performing either research or a practicum experience. Students typically do not perform original research; instead, they analyze existing ideas in current psychology literature and present their conclusions. The practicum offers hands-on experience in an approved professional setting. Students may also perform additional fieldwork for elective credit. The program concludes with a forensic psychology capstone during the final summer semester, requiring candidates to attend a one-week intensive session on the UND campus. Prospective students must hold a bachelor’s degree in a related field and demonstrate an undergraduate GPA of at least 3.0. Located in Muncie, Indiana, BSU's sizeable distance education program offers two online master's in psychology programs: a master of arts or master of science in educational psychology and a master of science in quantitative psychology. All degrees are presented entirely online and feature start dates in the fall, spring, and summer. Learners who take a full course load each semester may earn their degree in just 18 months. Students pursuing an educational psychology degree can choose from tracks in gifted and talented students, human development, neuropsychology, and applied behavior analysis. Candidates may also create a custom concentration by combining courses from different specialization tracks. All students complete 18 core credits and 12 credits of specialized coursework. Exploring topics in developmental psychology, assessment, and human learning and achievement motivation, the core curriculum introduces and strengthens foundational concepts and skills. Electives delve deeper into specific focus areas, including learning disorders, aging, and psycholinguistics. The neuropsychology specialization confers a graduate certificate and requires candidates to complete an additional three-credit course. The 33-credit quantitative psychology degree consists of a 21-credit core, a six-credit thesis, and six concentration credits. Core coursework emphasizes theory and methods for quantitative study, including variance analysis, multivariate statistical analysis, and applied regression analysis. Learners may pursue either a quantitative or mixed methods track, with each option providing two different pathways. The quantitative track examines data analysis methods in greater depth, while the mixed methods track addresses include qualitative techniques. All candidates complete a graduate thesis based on original research. Founded in 1794, UT Knoxville claims a unique distinction as the first chartered public university located west of the Appalachian Divide. As Tennessee's premier research-based land-grant institution, UT Knoxville boasts the prestigious R1 Carnegie classification. The school offers more than 900 undergraduate and graduate programs across 11 academic colleges, including a online master of science in educational psychology. The online master's in psychology at UT Knoxville features concentrations in adult education and applied educational psychology. Each focus area encompasses the same core curriculum but features unique concentration course requirements. While the MS in educational psychology is a non-thesis program, candidates must pass a comprehensive exam before graduation. The 36-credit master's in psychology online was created exclusively for a distance learning environment. UT Knoxville faculty and field professionals carefully developed the program to graduate students in six semesters, requiring learners to take two courses per semester. Graduates qualify to pursue a doctorate in educational psychology or a related specialty or for school, nonprofit, business, or government employment in the educational psychology field. UT Knoxville students complete courses synchronously through Canvas. Distance learners must attend classes in the evening at predetermined times. New students are admitted to the online MS in psychology program in the fall, spring, and summer semesters, provided they apply at least eight weeks before the start of the next term. Applicants must hold a bachelor's degree from an accredited school and a minimum 3.0 GPA. UNI has held many previous incarnations since the mid-1800s, including an orphanage and a normal school. Today, UNI's sprawling Cedar Falls campus enrolls nearly 12,000 students and offers more than 90 majors across six academic colleges. The university ranks among the nation's top schools for value and enjoys a positive reputation throughout the Midwest. Honoring its roots in teacher training, UNI's master's in psychology online emphasizes professional development for teachers in educational psychology. The program offers thesis and non-thesis options, each requiring 36 and 33 credit hours for completion, respectively. Combining required professional core and advanced academic coursework, the curriculum features a strong research component. Graduates sharpen their career skills by exploring advanced educational psychology concepts specific to classroom instructors. The online MAE in professional development for teachers explores assessment practices, mental health and wellbeing in educational contexts, and culturally responsive teaching methods. Applicants must hold a bachelor's degree from an accredited institution and should submit letters of recommendation and a statement of purpose along with their application. Prospective MAE in educational psychology candidates do not need to provide GRE scores. Students access coursework through Blackboard and additional learning technologies like Panopto, Adobe Connect, and Lynda.com. Each UNI instructor dictates their own preferred communication methods and technology requirements. Using a variety of online learning tools such as the G Suite, students complete assignments and conduct all correspondence in the virtual environment, including advising, tech support, and test proctoring. After founding the Puerto Rico Institute of Psychology in 1966, Dr. Carlos Albizu-Miranda expanded his educational endeavors to include a U.S. campus and opened Miami's Albizu University in 1980. Today, both locations offer programs that incorporate traditions and cultures unique to the San Juan and South Florida communities. Albizu University offers dozens of academic programs across seven schools, including an MS in industrial and organizational psychology online. Albizu University's online master's in psychology with a focus in industrial/organizational psychology prepares graduates for careers as I/O practitioners. The program, which comprises 42 academic credits and six applied research credits, culminates in a capstone experience. Students must maintain a cumulative GPA of 3.0 for the program's duration. The curriculum emphasizes concepts and strategies related to training and development, organizational development, selection and placement, performance measurement, and quality of work life. Applicants to the Miami campus must hold a bachelor's degree from an accredited institution and submit a statement of purpose and proof of appropriate United States citizenship. Admissions advisers show preference to applicants who hold a 3.0 GPA or better. Albizu University students complete online coursework through the SunPortal platform. Distance learners can access a variety of comprehensive support resources, including 24/7 tech support, an online bookstore, and communication through social media. Traditional and online students pay the same per-credit tuition rate for both the master's psychology and I/O psychology programs, regardless of their residency status. Located in Denton, UNT offers the amenities of a college town while placing students in close proximity to the Dallas-Fort Worth metropolitan area. The university offers over 200 bachelor's, master's, and doctoral degrees across 14 academic colleges, including more than 20 master's and four bachelor's degrees online. UNT's 38,000-strong student body includes National Merit finalists, Honor College students, and Terry Scholars. Candidates pursuing UNT's online master's in educational psychology can select from concentrations in research and evaluation or gifted and talented education. The 33-credit program features coursework unique to each concentration and a universal supervised research/program evaluation requirement. Students on the research and evaluation track examine survey research methods and statistics in education while practicing writing grant proposals. The gifted and talented emphasis explores human lifespan development, social and emotional elements of giftedness, and curriculum design for this subset of students. The curriculum follows a rotating schedule of consecutive three-, five-, and eight-week courses. Students in either concentration can complete the "summer to summer" program in roughly 15 months, although the gifted and talented emphasis includes an additional three-week semester. Distance learners may also complete a standalone master's certificate in either concentration or earn a certificate concurrently with their degree. Online students access course materials through Canvas. While out-of-state learners pay a higher tuition rate than Texas residents, UNT offers discounts to Oklahoma residents and military service members. The school offers payment plans to qualifying candidates and conducts registration during fall, spring, and summer terms. Established in 1870, Missouri S&T serves students one of the oldest technological universities in the western United States. The school administers programs to 8,600 learners from around the world and offers nearly 100 degrees in the arts, science, business, engineering, and computing. Missouri S&T's acclaimed distance education division offers an online MS in I/O psychology with thesis and non-thesis options. Students may choose a graduate certificate concentration in either applied workplace psychology or statistical methods in psychology. The curriculum includes 40 credits of core content, methods coursework, and thesis or non-thesis elective courses. For thesis students earning a master's in psychology online, the program culminates in a research project. Prospective Missouri S&T students must hold a bachelor's degree from an accredited university with at least a 3.0 undergraduate GPA. Applicants should also submit GRE scores, a statement of purpose, and letters of recommendation for consideration. Distance learners must also complete prerequisite courses in statistics or data analysis and research methods. Distance learners access online coursework through Canvas. Online students new to the virtual learning environment can participate in webinars and request help from the Missouri S&T's student support team. The university offers four-, eight-, and 16-week courses online throughout the spring, summer, and fall semesters. Distance students pay a set per-credit rate for the I/O psychology graduate program, regardless of their state of residence. Eligible military students may qualify for tuition discounts. Founded in 1886, NLU functions as one of Chicago's oldest nonprofit schools in the private sector. In addition to its main campus in downtown Chicago, the university maintains five locations across the city and in Florida. NLU offers nearly 20 undergraduate and graduate programs in business, education, criminal justice, healthcare, and psychology and enjoys recognition for both affordability and graduate achievements. Students can complete NLU's MA in psychology in a web-based or blended format. The program offers three concentration options: general psychology, community psychology, and teaching of psychology. Each concentration's curriculum emphasizes mastery of human development and behavioral assessment and evaluation. Graduates take on a variety of psychology-based leadership positions in fields such as business, human services, and education. Distance learners enrolled in NLU's online master's in psychology program may concurrently pursue a master's certificate in one of five focus areas. Additionally, the university offers a related MS in I/O psychology. Candidates who choose to take hybrid or blended courses fulfill on-campus requirements at NLU locations in Elgin, Lisle, downtown Chicago, Skokie, or Wheeling. UNL students can complete their degree in around 20 months. Distance learners enjoy access to a variety of online resources through the UNL portal, including advising, virtual assignments, and dynamic communication tools. Dedicated enrollment specialists walk new students through the process of applying for financial aid. Funding opportunities include tuition discounts for military members and their families and exclusive scholarships for online students. Praised for its online master's programs by outlets such as U.S. News and World Report, CBU Online offers more than 40 web-based bachelor's, master's, and doctoral degrees. Students may choose from dozens of majors in healthcare, business, and education, all centered around Christian principles and values. CBU's online master's in psychology prepares candidates for careers in Christian marriage counseling, family psychology, and clinical counseling. Students may choose an optional professional clinical counselor concentration. The 62-credit program consists of core coursework, electives, and concentration courses when applicable. Candidates must fulfill prerequisite coursework in developmental psychology, research methods and statistics, and theories of personality. Graduates are eligible to pursue a state marriage and family therapist license or professional clinical counseling licensure. Distance learners complete a two-part practicum and supervised psychotherapy experience before earning an MS in counseling psychology. Course topics explore counseling techniques, human growth and development, and diversity issues in counseling. Applicants must hold a bachelor's degree with a minimum 2.5-2.75 GPA and provide a personal statement describing the student's religious background and interest in counseling psychology. CBU students use Blackboard to complete assignments and review materials. Online learners enjoy access to a variety of resources including a help desk, disability services, and career assistance. New students can also participate in a series of orientation webinars. Most students earn their MS in counseling psychology at CBU in 24 months. Regardless of their state of residence, all distance students pay a flat, per-credit tuition rate. Located in Beaumont, Texas, LU enrolls more than 15,000 students, placing it among the state's fastest-growing schools. The university occupies a 292-acre campus between Houston and the Louisiana state border. LU proudly offers over 100 programs across five academic colleges, including more than 40 online options. LU's online MA in education features a specialization in clinical mental health. Consisting of 60 credits, the program introduces advanced concepts related to counseling, human growth and development, and crisis prevention and intervention. Students must complete a two-part practicum, an internship, and two on-campus academic residencies to earn their master's in psychology online. Distance learners must complete practicum and internship courses consecutively throughout the fall, spring, and summer semesters. The residency requirement includes a five-week Blackboard course and periodic face-to-face sessions on campus. Financial aid is available to help cover costs associated with the residency session. Distance learners on an accelerated schedule can complete their online master's in psychology in as little as 30 months. The CACREP-accredited program qualifies graduates to seek licensure in Texas or the student's home state. Applicants must hold a bachelor's degree with a minimum 2.5 GPA. LU charges one flat tuition rate for the entire program. LU students complete online coursework through a customized learning platform called LULearn. Most online courses feature an asynchronous format in the virtual classroom. Distance learners enjoy 24/7 tech support, video tutorials, test proctoring, and discussion boards. Candidates may begin their studies on one of eight start dates throughout the year. Established in 1931, ULM's 238-acre campus sits atop Bayou DeSiard in eastern Monroe. The university encompasses twin cities Monroe and West Monroe, the city of Bastrop, and Union Parish, serving a student body of roughly 91,000. ULM offers more than 72,000 academic programs over four primary colleges: arts, education, and sciences; business and social sciences; health sciences; and pharmacy. ULM's online master's in psychology enjoys a nationwide reputation for value, affordability, and academic rigor. The MS in psychology offers optional psychometric and forensic concentrations. Students who do not choose a concentration must complete a core course in personality and social psychology, 18 hours of electives, and a directed study project. All psychology master's program candidates must complete prerequisite coursework in research methods, neuropsychology, and quantitative methods in the behavioral sciences. While distance learners can complete the master's in psychology almost entirely online, the psychometric concentration requires one semester-long residence on campus. Applicants must hold a minimum undergraduate GPA of 3.0 for unconditional admissions consideration. Students with a minimum 2.75 GPA must also demonstrate either a minimum combined GRE general test score of 290 or a minimum formula score of 800. ULM students pay a special per-credit tuition rate for online-only graduate coursework. Online students access course materials through the Moodle learning platform. Distance learners can use additional resources such as advising, proctoring, and tech support. Students may consult a dedicated student advocate for assistance with online registration, scheduling, and specific program requirements. ULM also offers career services, disability services, and financial aid advising. Founded in 1946 in Longview, Texas as a male-only technical institution, LeTourneau went coed in 1961. The same year, LeTourneau began offering innovative evening and weekend courses through the LEAP program. Today, this Christian university serves more than 1,100 students, offering over 140 majors across eight schools and colleges. Graduates of the university's School of Psychology and Counseling enjoy a 93% career placement rate. LeTourneau's online master's in psychology provides the knowledge and skills needed to land nonlicensed psychology or counseling positions. Students interested in pursuing a Texas licensed professional counselor certification may do so by applying credits earned in this program toward LeTourneau's MA in counseling degree. Combining core and elective coursework, the 39-credit curriculum culminates in a field experience. The program's unique interdisciplinary approach allows students to choose elective courses in a variety of fields, including education, religion, business, and leadership. Like traditional on-campus students, distance learners can fulfill the field experience requirement through LeTourneau's School of Psychology and Counseling; Psi Chi, the international honor society in psychology; or Kappa Psi Delta, the university's psychology club. Prospective students may apply during the spring or summer semesters. LeTourneau offers a special annual discounted tuition rate for all online programs, although the MA in psychology may incur per-credit fees specific to certain courses. LeTourneau students complete coursework and submit assignments through Blackboard. Distance learners also use software and platforms through the university portal, LetNet, to access school email, library databases, and MyFiles services. Most online courses are presented asynchronously. Set amidst the Rocky Mountains, UNC has built a reputation as one of the nation's premiere research universities since it was founded as a teachers' college in 1889. Today, the school serves nearly 13,000 learners, over 40% of whom are first-generation college students. UNC offers more than 100 undergraduate and 120 graduate majors through six academic colleges. The university strives to provide students with a personalized learning experience, and most classes boast a student-instructor ratio of just 18-to-1. UNC's online master's in psychology includes an education psychology concentration with a specific emphasis on teaching applications. This unique MA degree prepares graduates for advanced career positions that utilize psychology in classroom contexts. Learners complete 39 credits, examining problem-solving, practical classroom applications, and education technology. Students who complete the online master's in educational psychology can pursue nonlicensed positions in K-12 education, education or business training, and school management. Students complete the program within a cohort, beginning the degree in the summer term and taking two courses per semester. Each summer term consists of one eight-week session, while fall and spring terms comprise two consecutive eight-week sessions. The program culminates in a comprehensive written exam administered during students' final semester. A leader in distance learning as early as 1902, UNC offers online students the latest technologies and support services, including an Extended Campus advising team and three satellite learning centers throughout Colorado for students interested in a blended program format. Online students pay flat tuition rates, regardless of their state of residence, and can earn their degree in just 19 months. With campuses in Buffalo and Rochester and a thriving online learning division, this western New York institution features accessible degree options to fit every schedule. The college's eight academic schools offer associate, bachelor's, master's, and doctoral programs and certificates that emphasize both professional training and academic scholarship. Medaille offers courses in a variety of learning formats — including day and evening classes and FLEX Advantage — and proudly features transparent tuition pricing and small class sizes. Presented through the Buffalo and virtual campuses, Medaille's master's degree in psychology online provides flexible course schedules and completion times. Students may pursue an optional sports psychology concentration. The 36-credit program encompasses 1-4 seven-week courses each semester (depending on the individual student's preferred course load) and includes an internship component. Distance learners can complete the core program in just one year. Students may complete their internship at the Medaille Family Counseling Center, a licensed outpatient mental health facility in Buffalo. Learners may begin their studies in the fall or spring semester. Prospective doctoral candidates who wish to become licensed clinical psychologists may apply completed credits toward Medaille's Psy.D. degree. Medaille's MA in psychology or sport psychology readies graduates to take nonclinical positions in PR, HR, higher education, and sports management. Medaille students complete online coursework in Blackboard. Applicants must submit transcripts from all previously attended colleges, a resume, an essay describing their academic and professional goals, and two personal references. All distance learners pay a flat, per-credit tuition rate, and active-duty military members enjoy special tuition discounts. Established in 1939, this Lake Charles, Louisiana institution ranks among the top national public universities. McNeese holds a crucial position within the Louisiana State University System, one of the country's largest state college networks. The university enrolls more than 7,500 learners and offers over 60 undergraduate and graduate degrees across eight schools and colleges. McNeese's master's in psychology online features an applied behavior analysis (ABA) concentration. The MA in ABA holds programmatic accreditation from the Association for Behavior Analysis International. This 55-credit program explores topics like behavioral assessment, psychopathology, and social and cultural diversity. While students do not need to complete a thesis to earn the degree, graduation requirements include a practicum/internship component. Learners can fulfill in-person requirements through the Clinical Applied Behavior Analysis Academy or the McNeese Autism Program. Applicants must earn a minimum GRE score of 285 and demonstrate a cumulative undergraduate GPA of at least 2.5. Prospective online MA in psychology candidates must also complete prerequisite coursework in abnormal, experimental, and social psychology. All students pay the same per-credit tuition rates. Courses are held over the fall, spring, and summer semesters. McNeese students use the Moodle virtual learning platform to review course materials and submit assignments. Distance learners must enroll in at least six credit hours to claim full-time status and qualify for financial aid. Transfer students must complete at least 25% of their overall course credits, including the final 30 credits, at McNeese. Online students enjoy flexible payment options and funding opportunities, including financial aid, scholarships, diverse payment methods, and installment plans. Danny Kofke is currently a special education teacher in Georgia. He has also taught prekindergarten, kindergarten, first grade, second grade, and sixth grade and has been an educator for 15 years. Danny's love of teaching and helping others win with money led him to write four personal finance books, including the recently released "The Wealthy Teacher: Lessons For Prospering On A School Teacher's Salary." Why did you choose a career in education? Was this something you were always interested in? I knew I wanted to be a teacher after having Mr. Stutzke in 9th-grade civics. He was just one of those special teachers that many educators have had that led them into teaching. I originally wanted to teach history and coach high school baseball. I ended up taking a semester off college and taught at a preschool. I worked with the 3-year-old class. I realized how much I enjoyed the little ones and decided to change my major to elementary education. As they say, the rest is history! What were some of the most crucial skills that you gained in your studies that apply to your job on a daily basis? I have to admit, it was really difficult to apply much of what I learned in college to my teaching because I really did not know how it applied. I would have to say my student teaching experience was the most valuable time I spent in school. I was blessed to have a wonderful mentor-teacher and I learned how I wanted to run my classroom from her. What was the job search like after earning your undergraduate degree? Did you feel prepared to make the transition from student to professional? I graduated in December and started off by being a substitute teacher. This helped me greatly! I was able to experience a few grade levels (I had student-taught first grade so that was where I felt most comfortable, and subbing helped me branch out to other elementary grades). In addition, there is nothing like the feeling you get after running a class by yourself for the first time. It was through my substitute teaching that I gained the confidence that I could actually be a teacher! After two months of subbing, I landed a long-term substitute teaching job in a second-grade class and taught that from mid-February until the end of the school year. What advice would you give to education students who want to get the most experience they can out of their undergraduate studies? Volunteer in as many classrooms as possible. Before student teaching, I was able to do this in a few classrooms and observed some great teachers (along with some not-so-great ones). I was able to see — firsthand — sound and not sound teaching practices, which helped shape the way I would eventually run a classroom. Do you plan on earning a graduate degree? Why or why not? If so, in what subject? I do not, at this point. This is my 16th year in teaching, and I am not sure how much longer I will remain in the classroom. After teaching for a few years, I actually wrote a personal finance book for teachers. This led to three more books (and maybe more in the future). These books have led to opportunities outside of teaching. Since I am unsure what my future in education holds, I have decided to spend my extra energy, time, and money on my books. What advice would you give to education students who are debating whether to earn their degree online or on campus? I know earning a degree online is now something many do and, while you can't beat the convenience, I really feel learning on campus is greatly beneficial (at least it was for me). It was great for me to be able to talk with others who had the same fears and concerns that I did. Teaching is one of the most difficult and rewarding careers there is. It can be easy to get caught up in the negative things we constantly hear about the profession, but tune that out and remember why you became a teacher in the first place — to make this world a little bit better! Each teaching program has its own unique offerings, but most feature similar coursework and practicum requirements. See below some general information on seeking a bachelor's degree in teaching online. This track gives students the education and training they need to prepare for entry-level positions teaching kindergarten through eighth grade. Most programs involve the study of multiple subjects, including mathematics, language arts, science, and social studies, as elementary-level teachers must have comprehensive knowledge across these areas. Students who concentrate on secondary education prepare to deal with adolescents who are nearing the initial stages of adulthood. Common areas of focus include secondary teaching methods, adolescent psychology, and effective classroom management strategies. Special education is a rewarding but challenging field that deals with young people who may have a wide range of disabilities. Coursework often involves a combination of best practices in learning and instruction, along with various classes focused on the special education environment. Fundamentals of Teaching: This course offers a sound introduction to the teaching profession, including core theories and practices, legal and ethical issues, and basic strategies in classroom management. Students may also explore some current and future challenges in the field of education. Child Growth and Learning: Students receive a comprehensive review of childhood development and learning, and how these concepts influence common best practices in a K-12 classroom. This gives the online teaching students a solid foundation in the psychological aspects of teaching and learning. School, Family, and Community: This course focuses on how traditional and nontraditional families and parenting styles affect educators at all levels of the K-12 education system. HOW LONG DOES IT TAKE TO GET AN ONLINE BACHELOR'S IN TEACHING? Most online education degrees require students to successfully complete 120 credit hours, including general education and program-focused courses, before obtaining a bachelor's degree. This usually amounts to a three- or four-year program, though class availability and the time it takes to complete required practicums may affect program length. Prospective students should also consider program structure when researching the best online schools for a teaching degree. Some programs place students into cohorts, where they generally take classes with the same group of individuals as they work toward their degree. These students may get to know their classmates and run group projects more efficiently, but cohort programs do not offer the same flexibility as self-paced ones. Applicants should also consider whether their prospective schools are regionally or nationally accredited. The accreditation process demonstrates that institutions provide students with a rigorous and beneficial educational experience, and that they remain dedicated to continuous improvement. Generally, regional accreditation is considered more vigorous and prestigious, though numerous high-quality schools pursue national accreditation, instead. Applicants may also consider program-specific accreditation for education degree options.The foremost accreditor for these programs is the Council for the Accreditation of Educator Preparation, which maintains stringent standards for schools that educate future pre-kindergarten through 12th-grade teachers. To ensure the continual quality of the accrediting agencies themselves, the U.S. Department of Education (ED) and the Council for Higher Education Accreditation (CHEA) provide both oversight and certification to these agencies. The ED distributes recognition based on whether an agency is a credible accreditor of colleges and universities. CHEA, a nonprofit association of more than 3,000 higher learning institutions, oversees about 60 different accrediting agencies. Due to the constant demand for qualified teachers and school personnel, graduates with their bachelor's in education enjoy favorable employment rates. A recent survey by Georgetown University's Center on Education and the Workforce found that experienced college graduates with a degree in an education field face an unemployment rate of 3.7%, while inexperienced education degree-holders face an unemployment rate of 5.1%; by comparison, the national unemployment rate for all occupations sits at 4.9%. Using NCES data for college graduates between the ages of 25 and 29, the table below compares unemployment rates for general education majors to rates for other common bachelor's degree fields. As the table indicates, middle school and secondary school math teachers earn the largest median annual salary at the mid-career level, with a salary gain of 64% from the entry-level to mid-career mark. However, salaries for employees with a bachelor's in education depend on specific job titles and degree fields of study. The next table features career salary growth projections for teachers at the four major educational levels. College professors experience the highest growth of the four professions listed, with a 65% salary increase between the entry-level and late-career stages. The remaining three occupations have comparable growth projections, ranging from an increase of 43%-50% after 20 years in the workforce. Students who graduate with an online bachelor's in education qualify for dozens of jobs at the elementary, secondary, and postsecondary levels, though individual eligibility depends on factors like district size, licensure, and place of employment. Teaching positions at the four major grade levels are outlined below. Kindergarten and Elementary Teachers: These teachers specialize in leading classrooms with students aged 5-11. They focus on fundamental subjects like English reading and writing, mathematics, science, and social studies. They often incorporate music, art, games, and other activities into their lesson plans, in order to engage and stimulate their young students. Middle School Teachers: These teachers lead classrooms with students in the seventh and eighth grades; some middle schools also include sixth and ninth grade, as well. They build on the core knowledge and skills students have gained at the elementary level, while also preparing them for the academic demands of high school. High School Teachers: These teachers lead classrooms with students in the ninth, 10th, 11th and 12th grades. Most high school teachers specialize in one subject, and prepare lessons that address advanced concepts in their area of expertise. Due to the importance of high school grades for college applicants, high school teachers also work closely with students who struggle in certain areas. Postsecondary Teachers: Postsecondary teachers, or professors, lead courses at colleges and universities. Like high school teachers, most professors specialize in a specific academic subject. In addition to lectures, labs, and other classroom activities, postsecondary teachers may take on administrative duties at their school of employment, or assist students through academic advisement. Making professional connections and learning about different approaches to education is crucial to success. Professional organizations offer a great entry point for students who want to learn more about their chosen career path. Below, find three of the country's most prominent organizations established for professional educators. These organizations host networking events, provide online trainings, maintain active job boards, and offer other services for career-ready college graduates. This organization works to create policies that improve the quality of classroom education and work environments for professional educators. The council's website features an extensive policy library, plus information about various NCTQ projects in all 50 states. Working to improve public education from preschool to graduate-level studies, the NEA provides resources on current regulations, strategies for securing financial support and tools for creating high-quality lesson plans. Membership opportunities are available for working employees, retired professionals, and students. This nonunion organization creates tools and resources that increase student achievement and positive classroom outcomes. The AAE currently represents more than three million members at various grade levels across all 50 states. Who Can Apply: TEACH provides annual grant funding to students who commit to teaching in low-income areas for at least four years after graduation. To apply, undergraduate, post baccalaureate, and graduate students must fill out a FAFSA and sign a TEACH agreement. Students must also maintain good academic standing to apply. Who Can Apply: The Bright Futures Scholarships fund provides monetary aid to students studying early childhood education. To apply, students must provide transcripts, an essay, a resume, and letters of recommendation. The scholarship only accepts applications from candidates enrolled full-time at accredited two- and four-year colleges. Who Can Apply: Phi Delta Kappa, through the PDK Educational Foundation, distributes scholarships to high school, undergraduate, and graduate students studying elementary and secondary education. The foundation offers numerous scholarships: the advanced degree, the prospective educator, and Pi Lambda Theta study support. To apply, students must have current membership with Pi Lambda Theta, Phi Delta Kappan, or Educators Rising. Who Can Apply: The AFCEA provides scholarships to undergraduate and graduate students currently seeking licensure or a credential with the aim of teaching science, technology, engineering, or math to kindergarten through 12th-grade students. Candidates must have U.S. citizenship and a bachelor's or master's degree in a STEM-related field. Who Can Apply: The Robert Noyce Teacher Scholarship Program aims to inspire students studying science, technology, engineering, and mathematics to become teachers. Requirements include U.S. citizenship and at least junior standing in a bachelor's program. Recipients must agree to teach in high-need school districts for up to two years. Who Can Apply: The Thurgood Marshall College Fund offers the Center for Advancing Opportunity Undergraduate Research Scholarship to students pursuing education degrees at four-year historically black colleges and universities. Students who have a 3.0 GPA, U.S. citizenship, and a junior standing can apply for this scholarship. Who Can Apply: The American Association of Physics Teachers offers scholarships to undergraduate and high school students who want to work as high school physics teachers. In addition to the scholarship, winners receive a free, one-year AAPT student membership. To apply, students must have U.S. citizenship and good academic standing at an accredited two- or four-year college. Who Can Apply: The Jack Kinnaman Scholarship, named after the former National Education Association's vice president, provides funding to future teachers who demonstrate a financial need. Applications must include a letter of financial need, two letters of recommendation, proof of a minimum 2.5 GPA, and transcripts. Students must also hold updated NEA membership. Despite the relative affordability of online programs, most students still need financial assistance. Students should complete a Free Application for Federal Student Aid (FAFSA) to learn more about the loans, grants, and other aid opportunities offered through the U.S. government for which they might qualify. Additional private grants and scholarships are widely available through nonprofit organizations, companies, and other sources. Check out our collection of resources below to learn more about financial aid options. Completing the FAFSA marks a crucial first step for any student with financial needs. Our FAFSA guide features a step-by-step rundown on the process, plus answers to several frequently asked questions. Financial aid for online learning is equivalent to that for campus-based learning, but that hasn't always been the case. Learn about changes that have taken place, and different funding opportunities available to online students.